Missing teeth, no matter how many, have a significant impact on your life. Not only do they affect your smile, often leading to self-consciousness, missing teeth affect your abilities to eat and speak properly. Suddenly, simple tasks become difficult. You can no longer bite and chew many of your favorite foods, and those around you have a difficult time understanding you when you talk. Dentures are a common solution to tooth loss, and now there are custom dentures in place of the traditional ones. Traditional dentures are removable prosthetic teeth. The teeth are set into an acrylic, gum-colored base that rests directly on your gums, and are meant to be removed every night for cleaning. 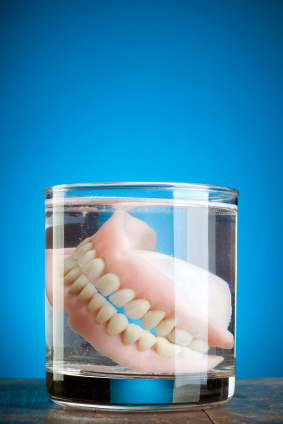 These dentures are made from a mold of your mouth, which helps to ensure a proper fit. There are two types of dentures: full and partial. Full dentures replace an entire arch of missing teeth, whereas partial dentures replace sections of missing teeth. One cosmetic drawback to traditional dentures is that they often look "too perfect." The teeth are too white and too straight, often leading others to take notice. Custom dentures are similar to traditional dentures in that they are removable false teeth that are designed to be removed every night. However, these dentures take into account that no two people are alike. Teeth are not perfect, and often have some very minor flaws. So, instead of perfectly pearl white, straight teeth, the teeth of your custom dentures are designed just for you. Teeth are individually placed, and can be placed slightly crooked or made to be a little discolored in accordance with your age. They can also be made to fit your specific bite, which is a great benefit if you still have some healthy teeth remaining in your mouth. Once placed, you will have a truly natural, completely unique smile once again. If you are missing teeth, whether it's just a few or an entire arch, custom dentures can help to restore your natural, unique smile. Contact our office to learn more!